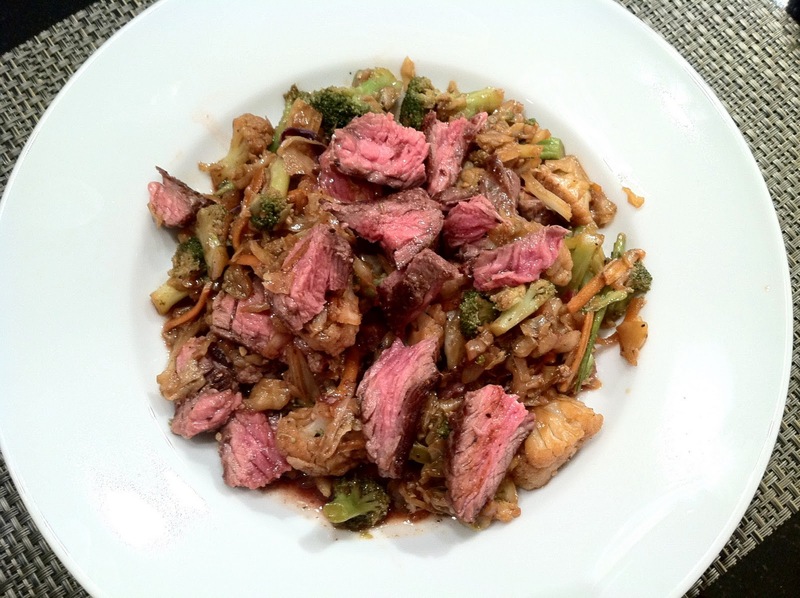 Everything Tasty from My Kitchen: Healthy Mushi Beef ......better than take out! Healthy Mushi Beef ......better than take out! Beef and Vegetable Stir Fry. This is one of my favorite dishes when I'm being really good and want to cut out sugar, carbs and fat. This is so delicious and you won't miss a thing from your favorite take out, except for the calories that is. I don't actually stir fry the steak, because I like my meat red and juicy in the center and I think it taste better to cook the steak separately and than toss together with the vegetables. If you like the savory taste of Mushi, you will love this. It's the cabbage that makes this taste so good. The other secret ingredient is using the Walden Farms dressing. It adds the sweetness and cuts the sharpness of the soy sauce and gives richness to the dish. This recipe would be excellent with chicken or shrimp too. With this recipe, you can have your take-out and eat it too!! Heat the oil and garlic in a large frying pan over medium heat for 1 minute. Add the broccoli, cauliflower, salt and pepper. Toss together and saute for 5-7 minutes until tender or use broccoli/cauliflower already cooked in the microwave from a steamed fresh bag and than cook for 4-5 minutes until the broccoli and cauliflower get a little brown and caramelize. Add the chicken broth, soy sauce, cabbage, and ginger. Toss together, keeping the heat on medium. Let cook for another 2-3 minutes and add the Walden Farms Balsamic Vinaigrette and toss together. Add red pepper flakes if you desire. This will give a little bit of mild heat. Toss with you favorite grilled or pan fried steak. Hint: Cut up a rotisserie chicken or use cooked shrimp to toss with the mushi.